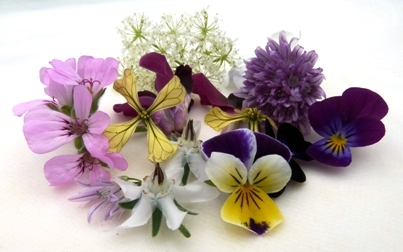 Roses, violets, calendula, dandelions, chamomile, lily and lavender, just to name a few, are nature’s way of provides us with lots of edible flowers used by many famous chefs to prepare dishes that are just out of this world. Find out how you can choose and use the perfect bouquet. 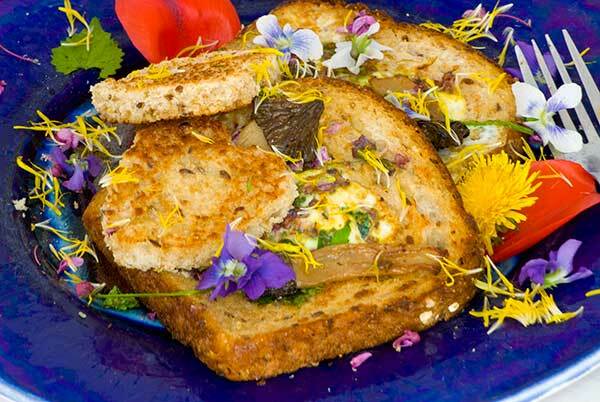 As the latest trend in haute cuisine, edible flowers have brought new botanical species to our plates. 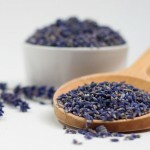 But if this is a recent discovery for foodies, the world’s great chefs have been using flowers as ingredients for more than a decade now: from rose petals to lavender, to more reassuring flowers like those of thyme, dill, coriander, chives or violets. 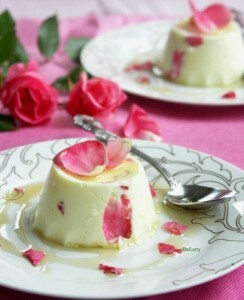 In the kitchen, flowers get used in the preparation of salads, gelatins, soups, flans, desserts and ice creams, and their use is not solely decorative: each one adds a unique, precise flavor to a dish. 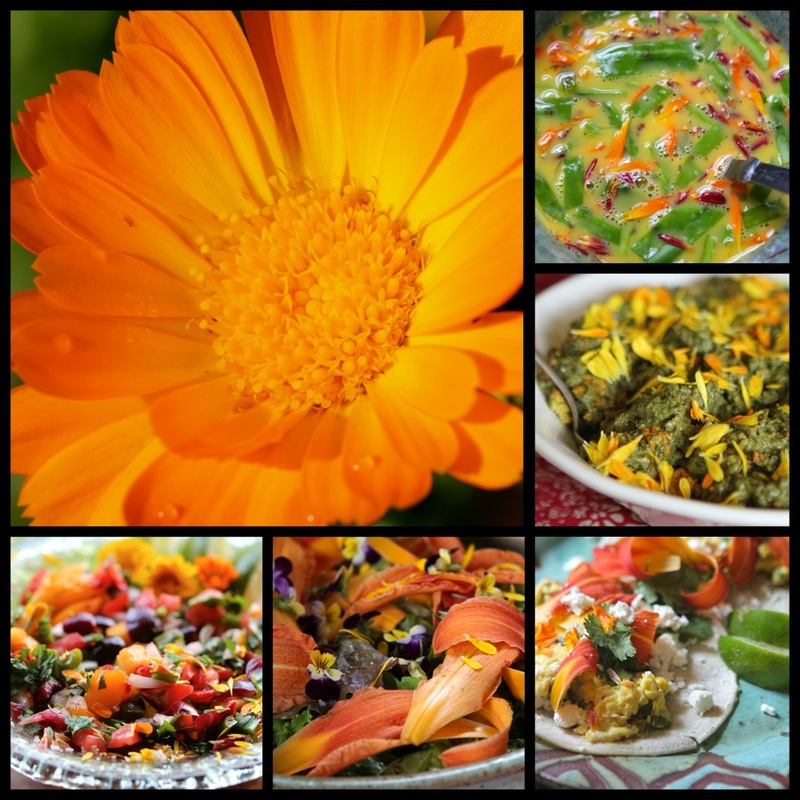 Calendula, for example, is slightly spicy; violet adds scent to everything; begonia has a citrus flavor and some spices like cloves can be immersed in wine, caramelized or used as decoration for cakes. And chrysanthemum flowers will add a pleasant bitter bite to your delicacies. 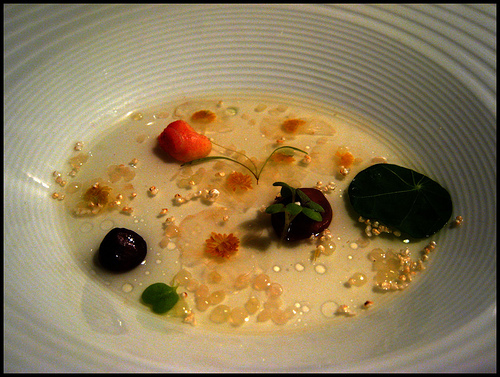 Anyone who’s ever had the good fortune to try a dish called Water Lilies from Ferran Adrià of elBulli, will probably never forget the experience, or walk through a garden in the same way: cashews are served over a soup of tea, geranium leaves and begonia flowers. The restaurant was only open for six months each year and would receive over 3 million requests for reservations, for its 60 cover space, which could only seat 8000 diners per six-month season. The dish must be unforgettable! When it comes to botanical cuisine, Spain’s chefs have been leading the way. “If I want rosemary I can use its flowers, which have a fabulous aroma, rather than rosemary as such. Another thing we like about them is their texture,” the Catalan chef Andoni Luis Aduriz, who’s been using edible flowers for years, has said. And its phrase that perfectly sums up the philosophy of those who go grocery shopping in the garden. This kind of approach is why flowers are so perfectly suited to the new kind of avant-garde cooking that seeks to satisfy all senses, not just our sense of taste. 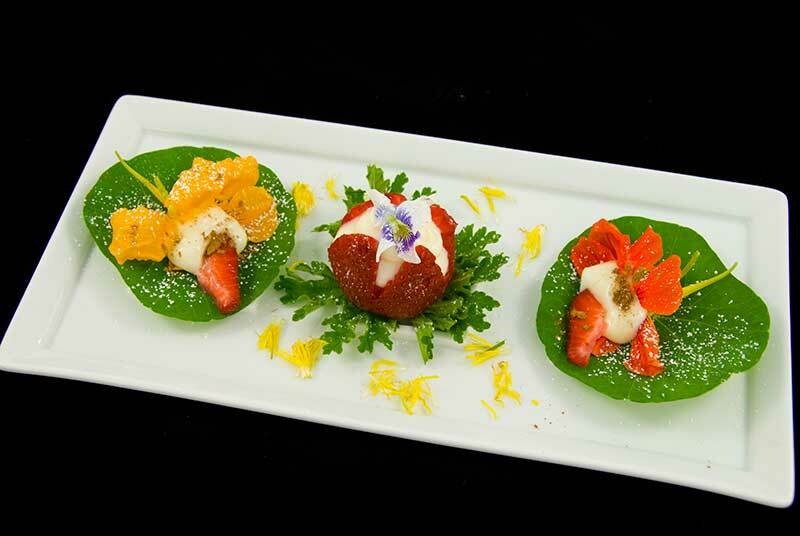 New York is just one of the cities known for its exquisite restaurants and that’s because chefs today have incorporated edible flowers, which are more common than one might think into their cooking. They’re using tulips, roses, dandelions, lilacs, and many more floral elements as part of their ingredients. 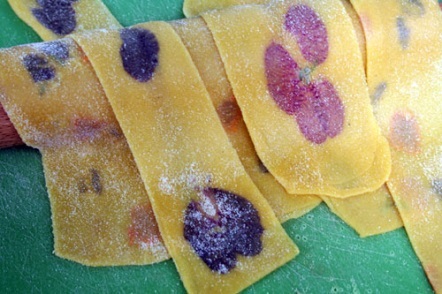 Roll edible flowers into your homemade pasta sheets for this lovely spring dish. Use Bob Red Mill’s Semolina Flour and the basic recipe on the package. 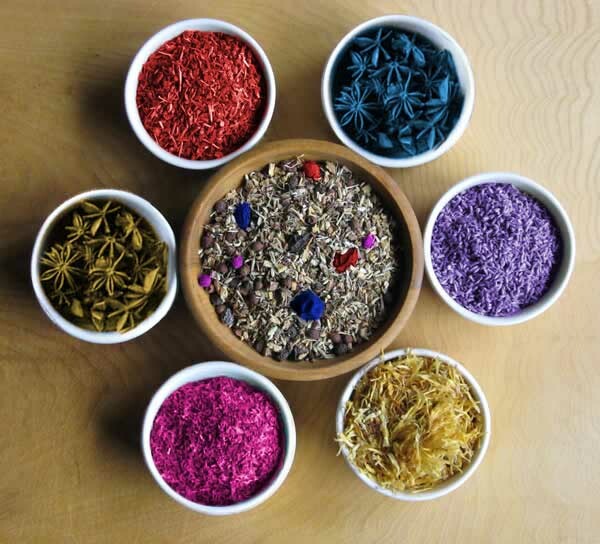 Cathy Wilkinson Barash, come to place flowers into flavor groups such as herbal, sweet and floral. Her list of edible flowers is according to flavor, and some, such as bitter, that may not appeal to everyone. Familiarize yourself with flowers in each of these groups, and then learn how to use them as food. Flowers with a simple, sweet flavor as well as those with a perfumed or floral taste are unbeatable for flavoring beverages, fruit salads and cake batter. Pineapple sage flowers have a hint of spice; dandelion flowers are sweet when they first open but become bitter as they mature. Honeysuckle’s sweet flavor is as magical to me today as it was when I first tasted it more than forty years ago. I make a luscious sorbet with the flowers, strawberries and water—no additional sugar is needed. ‘Sensation’, a showstopping lilac cultivar with deep purple flowers edged in white, is extremely flavorful and fragrant, but some varieties have a grassy flavor (those I don’t bother with). 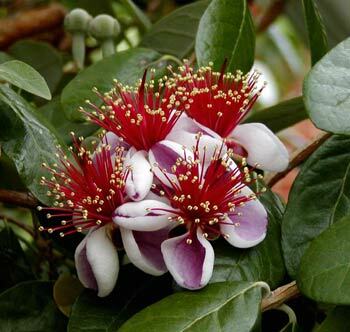 My favorite of all edible flowers are the succulent, fuchsia like blossoms of pineapple guava, a tropical tree that I grow in a tub and move outdoors is summer; they taste like ripe papaya. 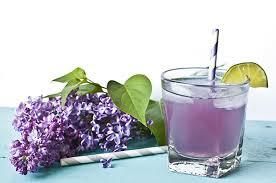 Flowers with a sweet, perfumy flavor, including lavender and sweet violet, can be overpowering, so use them sparingly. 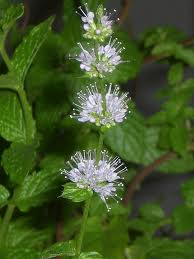 All of the mints, whether peppermint, spearmint or the less familiar apple mint, ginger mint and others, have flowers with a flavor like that of the leaves. Mint flowers add a cool sparkle to yogurt sauces and vanilla ice cream. Johnny jump-ups and pansies also have a mild minty flavor. Their delightful faces are particularly attractive placed on cheese. I once saw grilled veal chops sauced with a thin layer of parsnip puree and covered with Johnny­ jump-ups; with only the bone showing, it looked like flowery lollipops. 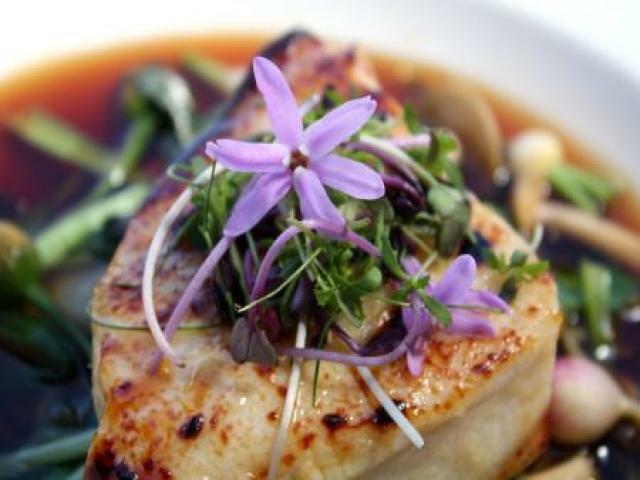 The mint flavor of the flowers complemented the grilled chop perfectly. 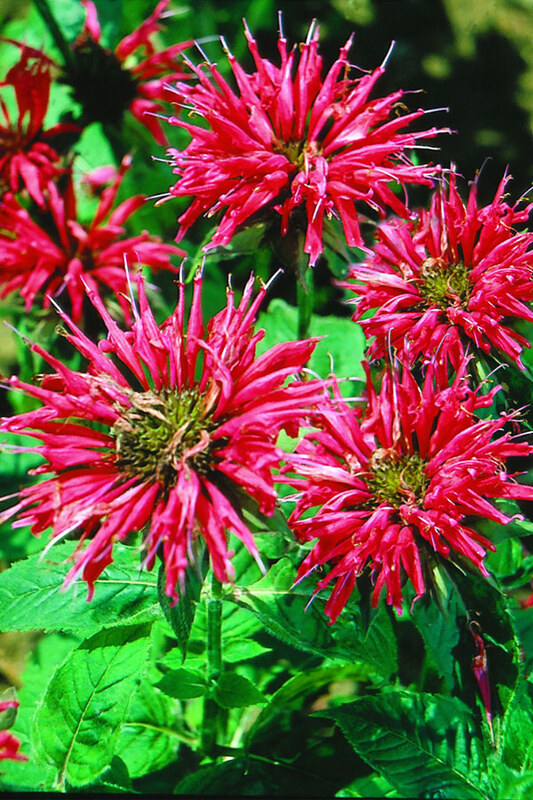 Red bee balm’s mint flavor has a strong, spicy overtone; other colors I’ve tried taste like mothballs. The licorice-anise flavors of anise hyssop and fennel flowers cleanse the palate and freshen the breath, and the flowers are fun to nibble on in the garden. Anise hyssop, with spikes of tiny violet florets from midsummer to frost, is one of my all-time favorites. 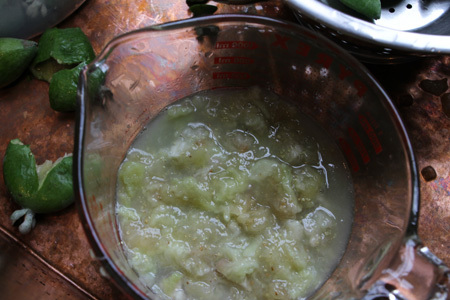 Fennel’s yellow umbels pair well with cauliflower and Lima beans and add a different flavor to apple pie. 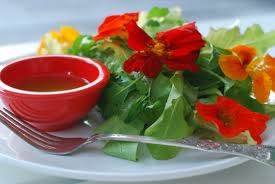 The red, orange or yellow blooms of nasturtiums are everywhere these days, from restaurant salad plates to supermarket mesclun mixes. 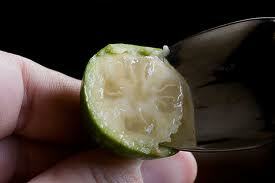 People tasting them for the first time often are surprised by their peppery flavor. Some of the newer cultivars have a sweet taste first, followed by a good peppery kick. 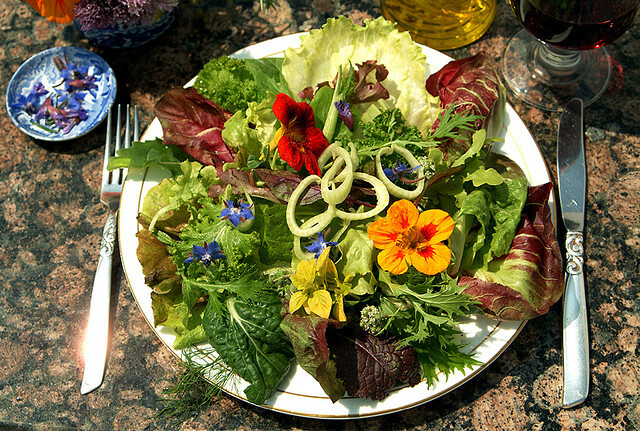 Arugula and mustard leaves are found in many salad mixes. If you grow these greens, you know that the leaves become too bitter to eat when the plants bloom. Instead of digging out the plants, enjoy the tang of the pale yellow, four-petaled flowers. You can also pick the flowers of broccoli and radishes that are past their prime. With distinctive flavors much like the vegetables themselves, they are especially well suited for salads. 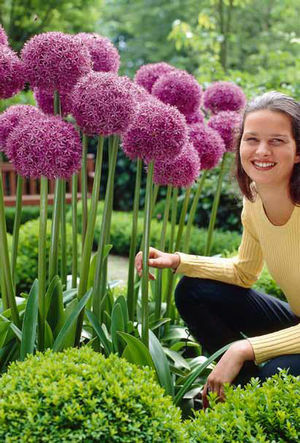 The flowers of the edible alliums and their relatives are composed of clusters of florets. 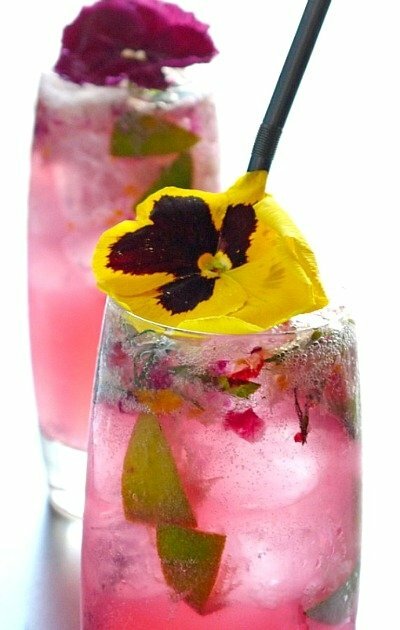 Because the flavor may be very strong, you’ll want to break the flowers into individual florets when cooking or garnishing with them rather than use the entire flower head. 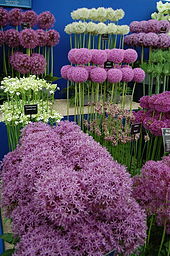 I couldn’t bear to be without chive flowers. Harvesting them from the time they begin to bloom in spring keeps them coming, although less profusely, all summer. Rub an entire mauve pom-pom in a wooden salad bowl to give a good oniony flavor to your salad and use florets to flavor marinades. 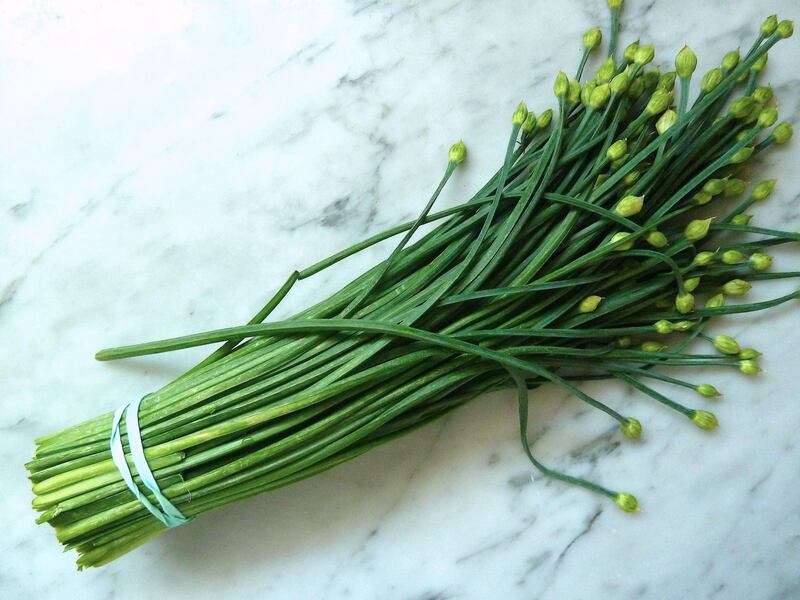 In late summer, garlic chives can contribute their white umbels of flowers to stir-fried dishes. The delicate lilac flowers of society garlic have the mildest flavor of this group. 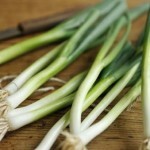 Sautéed nodding onion heads are a good addition to soups and stocks in midsummer. 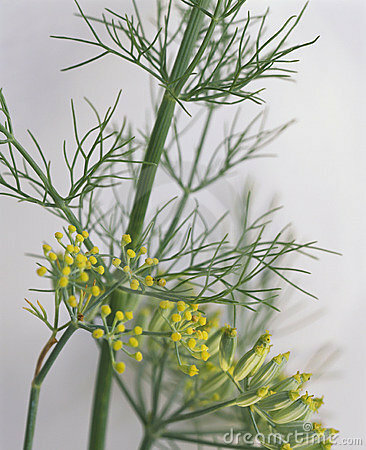 Edible herb flowers include the yellow umbels of dill, which give a dill flavor to pickling solutions and pair well with shellfish, and thyme, whose flowers may taste of lemon, caraway or garden thyme, depending on the variety. The tiny flowers of sweet marjoram are more delicately flavored than those of its cousin Greek oregano; both are favorites for flavoring vinegar. Basil’s delicate flowers uplift an otherwise ordinary pesto. Cilantro flowers have a mild flavor reminiscent of the leaves. These herb flowers consort well with vegetables, whether sprinkled atop cooked ones or mixed with oil and vinegar in a salad dressing. Chopped and mixed with sweet butter, they make a perky topping to baked or boiled potatoes. A little hyssop goes a long way; it tastes a little like quinine, but it is excellent in a robust salad dressing. Parsley is one of the few culinary herbs with non-edible flowers. 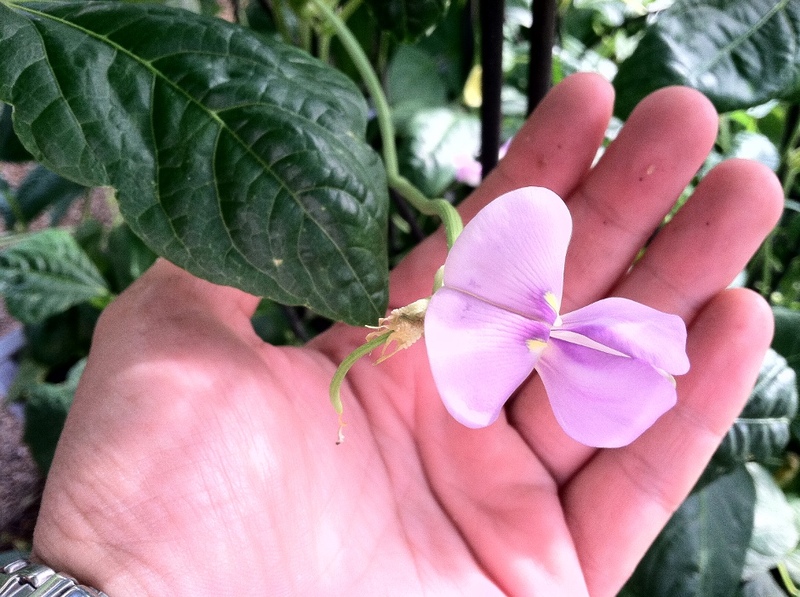 It’s no surprise that bean blossoms taste like beans. Their colors, ranging from white through pink to vivid red, add a dimension to any dish. What is surprising is that tulips taste like beans—or peas, depending on the variety. ‘Court Lady’, an ivory tulip with a stroke of green down the center of the petals, tastes distinctly like ‘Sugar Snap’ peas. In fact, the base of the petal even gives a wonderful crunch when you bite into it. The small pink flowers of the redbud tree, another member of the pea ­family, also have a good bean like flavor and crunch that are especially good in pasta with asparagus, which is in season at the same time. Eat only those flowers you know to be safe; some kinds are toxic. 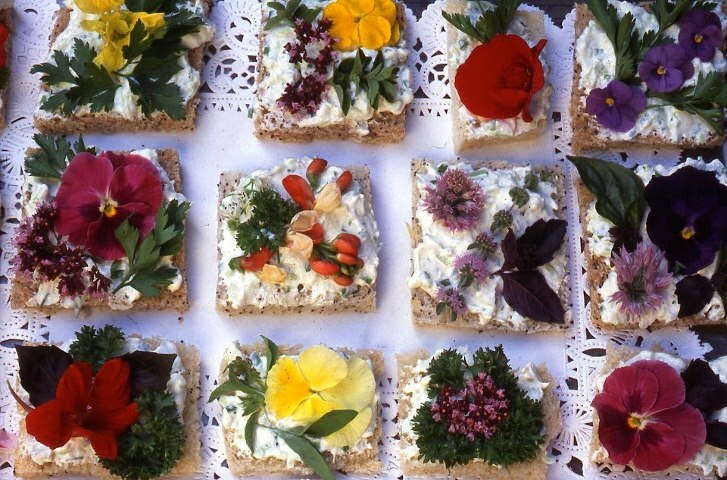 Eat only organically grown edible flowers. Don’t eat flowers from nurseries, florists or garden centers. Don’t eat flowers picked from heavily traveled roadsides. 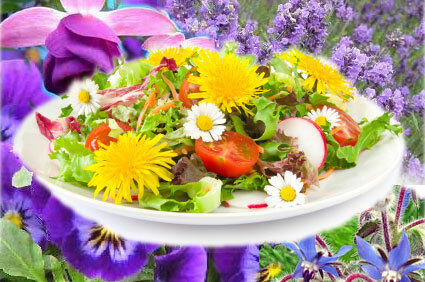 Don’t eat flowers if you have a history of allergies, asthma or hay fever. 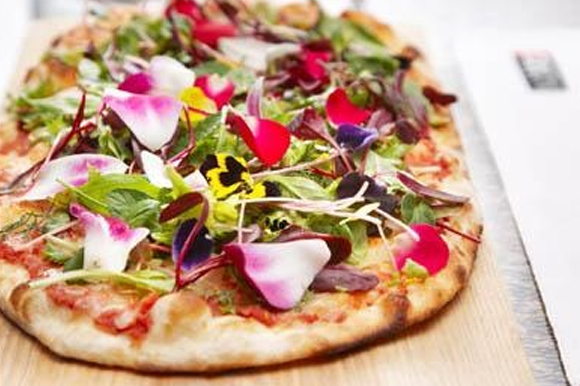 Eat only the petals, removing pistils and stamens (except those of tiny flowers such as lilac, basil and thyme). Don’t assume that a flower is edible just because it is garnishing a dinner plate. 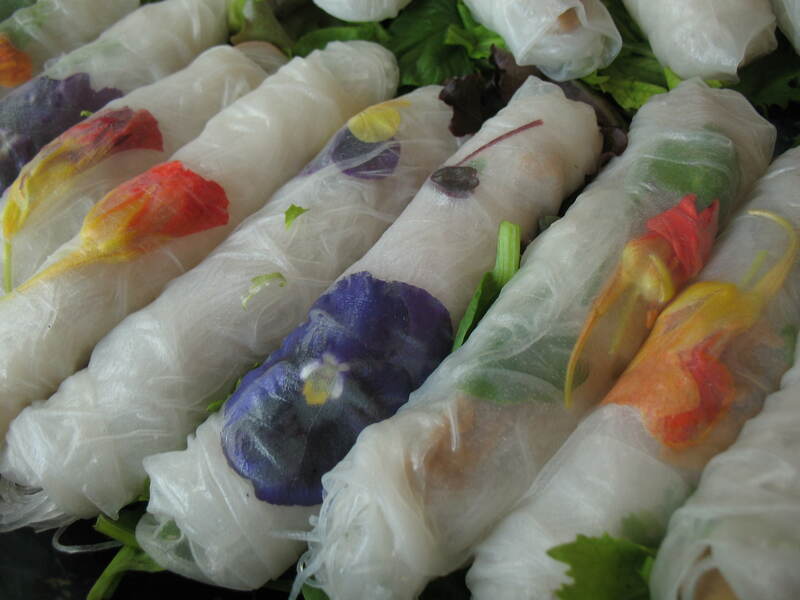 Taste flowers before you use them in a recipe, as they can vary according to variety and cultural conditions. 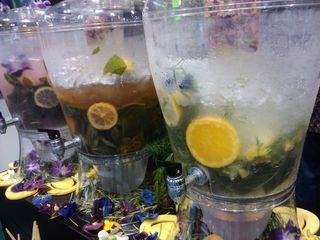 Rinse flowers in running water before tasting. 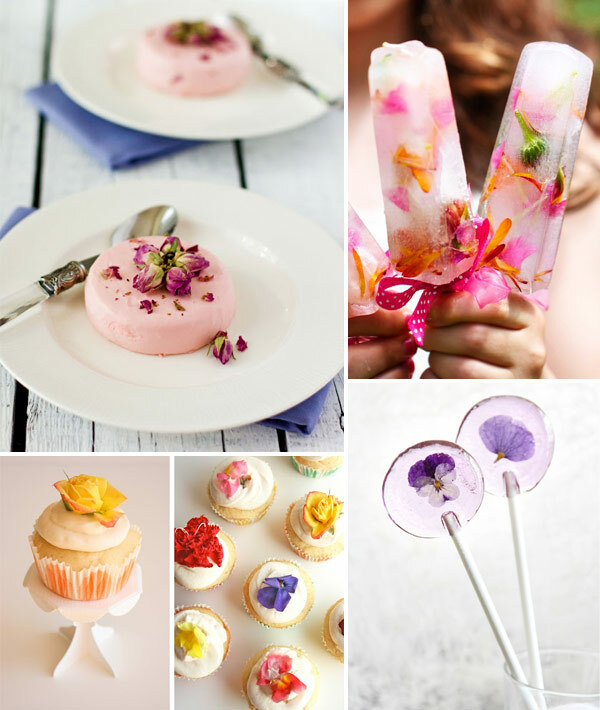 Exquisite crystallized flowers aren’t too pretty to eat. 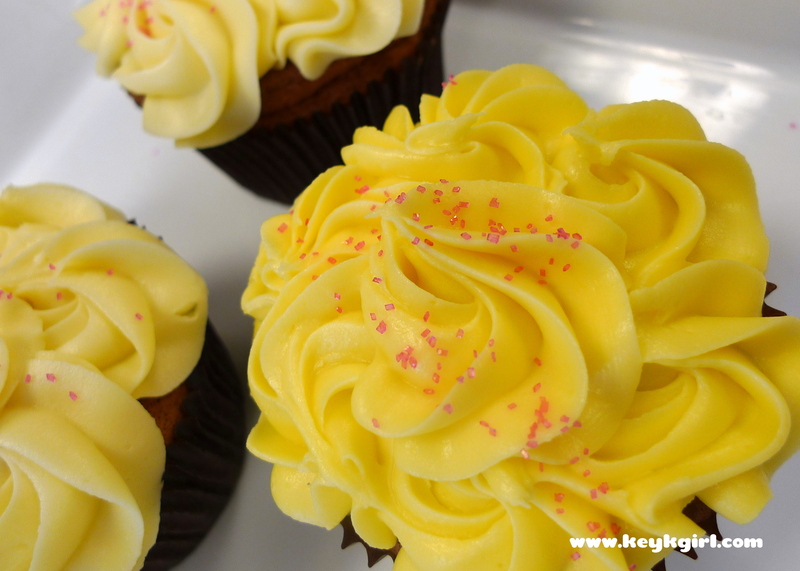 Here they add sweet appeal to bakery treats. 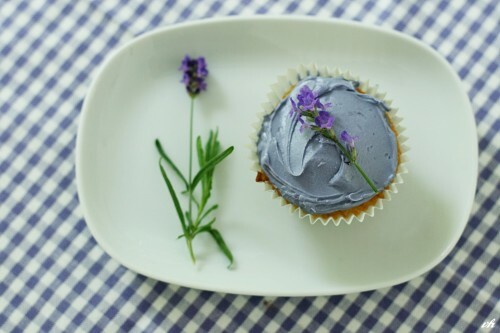 What goes better with a cup of tea than a tiny frosted cake topped with candied violets and mint leaves? 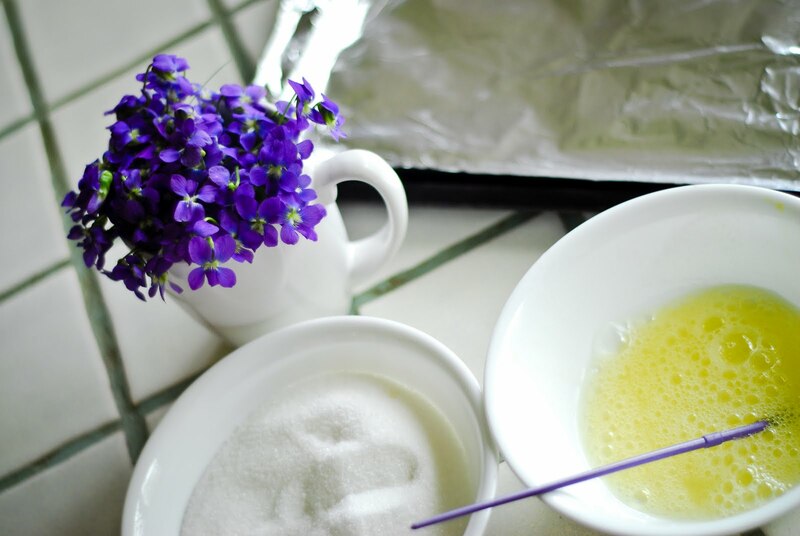 Preserving flowers and leaves with sugar requires some patience and time, but it is quite simple to do. Nearly everything you need is probably in your house. I use powdered egg white that I purchase at a cake-decorating shop; not only is it convenient and easy to use, it carries no risk of salmonella poisoning. I buy extra-fine granulated sugar there as well. 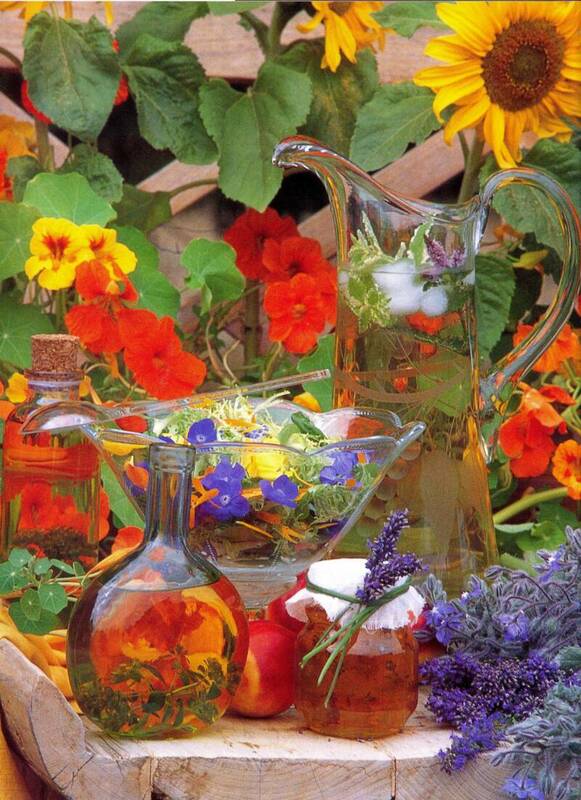 Any flowers and leaves you use must be edible and free from pesticides or other harmful substances. Choose blooms that are newly opened, free of dew, and clean, but wait to cut them until you are ready to preserve them so they will be fresh and firm. Limp or wilted blossoms will turn into sodden, sticky lumps. Remove any stamens as the pollen on them may cause allergic reactions. 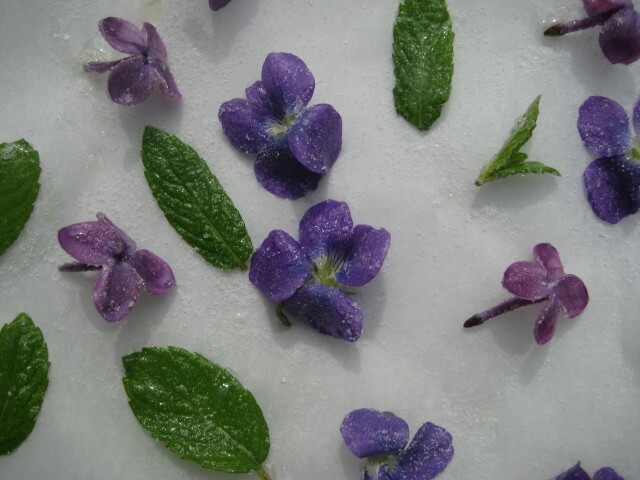 My favorite flowers for crystallizing include violas, pansies, miniature roses, bachelor’s-buttons, fuchsia hybrids, ca­lendula, lavender and lilacs. I use both the leaves and flowers of scented pelargoniums. Mint and lemon balm leaves both contribute a pleasing, sprightly taste and hold their color well. 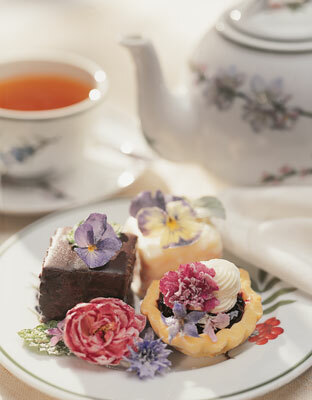 Use candied flowers or leaves as you would sugar sprinkles to make a simple dish of ice cream or a brownie special. Dress up fruit cups, tarts and pies. A cascade of crystallized blossoms swirling down a wedding or birthday cake is a sight not soon forgotten. The delicate beauty and color of flowers can be preserved for months if the flowers are properly crystallized and stored. 1. In a small bowl, whisk 1 tablespoon powdered egg white together with 3½ tablespoons water until slightly frothy. Lay a piece of waxed paper near your work space. 2. Pick three or four small flowers or one large one. 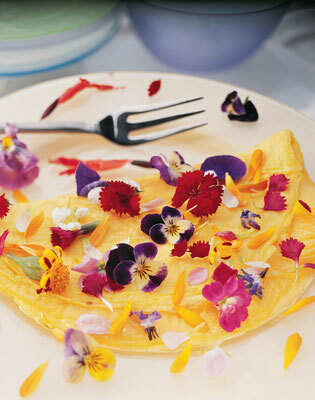 Holding each flower by the petals with tweezers, paint the front and back of each petal with the egg-white mixture. 3. 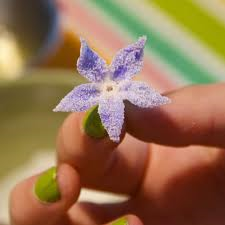 Holding the flower over another small bowl, sprinkle the back heavily with sugar, turning it so the sugar falls into the crevices between overlapping petals. Turn and sprinkle the front lightly. 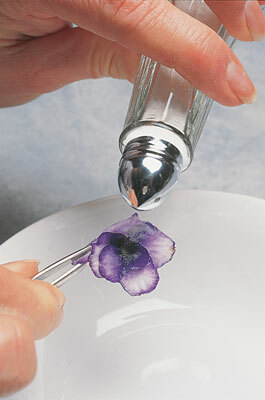 The lighter coating of sugar on the face of the flower will make it look more natural when dry. Place each flower on the waxed paper, face up, allowing plenty of room between blooms. 4. While the first batch dries, pick more flowers and coat them with egg white and sugar until you’ve done as many as you wish. After the first batch has lain on the waxed paper for about an hour, gently touch a flower to see if it has stiffened slightly. 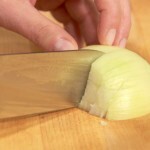 If so, slide the tip of a knife under it and move it away from any syrup that may have dripped off. Move it again in several hours. Place larger flowers such as calendulas and roses on a cake rack after the first hour to expedite drying. Place the flower-­covered waxed paper or rack in a warm, well-ventilated area until the flowers are completely dry. This may take as long as two weeks. When dry, the flowers are brittle and quite fragile, so handle them with care. 5. 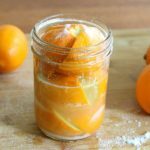 Pack the flowers loosely in airtight, shallow jars (wide mouth half-pint jars are perfect). 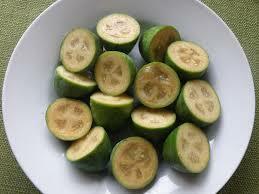 Stored in a dark, dry place (not the refrigerator), they will keep six to eight months. Exposure to light may cause the colors to fade. 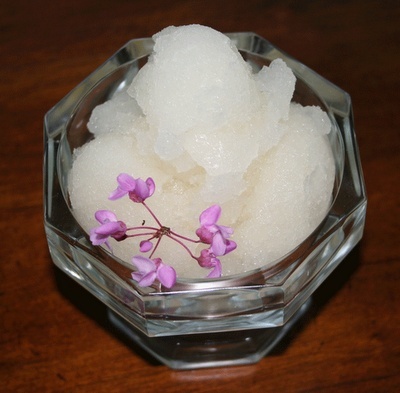 Lilac flowers give this sorbet a delicate flavor that’s not too sweet. 1. In a heavy nonreactive saucepan, bring the water and sugar to a boil over medium-high heat. Add the lilac flowers, lower the heat and simmer for 8 minutes, stirring frequently. 2. Remove the pan from the heat and let the liquid cool to room temperature; strain out the flowers if desired. Pour the liquid into an ice-cream maker and freeze according to the manufacturer’s instructions. 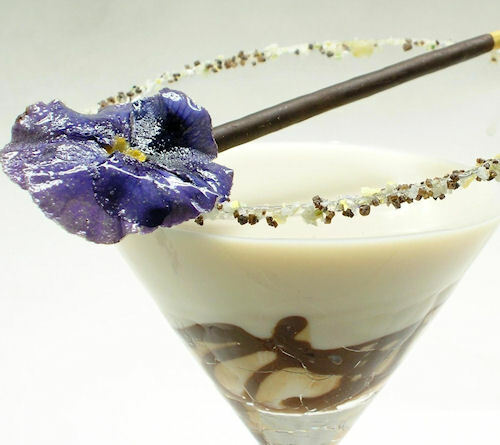 Serve topped with candied lilacs. If not serving immediately, place scoops of sorbet on a cookie sheet and freeze, then transfer to a resealable freezer bag or other suitable container. 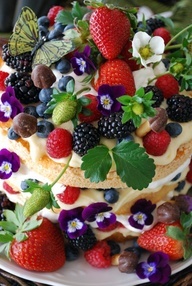 A garden party with its own botanical ingredients incorporated into the festivity would not only look beautiful but taste like something your guests have never tasted. There’s just endless ways you can apply these botanical wonders into our meals. 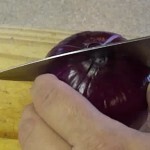 It will bring new pleasure in cooking for those who have lost their desire as well as their touch in creative imaginative, scrumptious meals their families will love. Get creative and put a cute little signature taste to your dishes. Your meals will be something your family and friends will be talking about for years to come. Want to make a breakfast that’s out of the ordinary for that someone special in your life, check out this great botanical combination. Having girlfriends over for brunch, here is a quick idea that will have them buzzing! 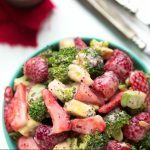 Add a delicious salad and cocktail or two and top it with a scrumptious piece of mouthwatering dessert and you’ve got yourself a get together with little effort.